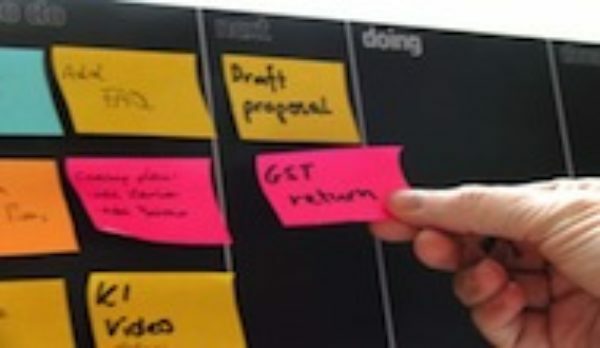 One of the most useful tools when introducing Agile into an organisation is personal Kanban. It gives me unique insights into an organisation's culture and values, and helps me determine my next steps. As an Agile coach, the process of getting people into personal Kanban facilitates insights into how an organisation works, how a team works, and how people work. It gives me insight into an organisation’s culture and mindsets, and based on people’s Kanbanfor1 boards can often reveal more about how people in an organisation work. Do people multi-task? Do they stack post-it notes in the doing column? If so, why? Is that a personal or organisational issue? Do they or their organisation allow for slack in their planning (days, weeks) or is every hour of the day planned? Is people’s idea of what they can achieve realistic? Is there a fundamental belief that utilisation, i.e. being busy all the time is the best approach? Do people work at a sustainable pace? Or do they just have too many things on their plate? Are people happy to share their Kanbanfor1 boards and provide visibility and transparency? It tells me about an organisation's beliefs and values, and helps me ask the right questions. It also helps me determine which behaviours might be driven by the organisation and which ones are personal. It often is a good indicator to figure out whether people are in an environment where they can develop good habits such as working on one thing at a time. From a coaching perspective Kanbanfor1 has worked very well for me and also for people who aren’t directly part of an Agile team. Product Owners and other management roles are usually a lot less well defined and more fluid than the role of an Agile team member and there’s usually no team board with tasks to provide visibility. I found personal Kanban extremely valuable in providing this visibility and it has helped me tailor continuous coaching processes and conversations. Clients have told me they have found Kanbanfor1 very valuable - in addition to managing their work it has provided great talking and discussion points and over time it produced an achievement log that we could use to adjust and focus the coaching. It is important to note though that this worked because my clients and I trusted each other and had a very clear coaching agreement. I’d never force this on a coachee and I always back off if people aren’t comfortable with the visibility. Some people might find the visibility and transparency of Kanbanfor1 at work controversial and the potential for micro-management and control does exist and should be taken seriously. I recommend only using open Kanbanfor1 boards at work if there is a culture of trust, openness and collaboration and if people feel safe to share the nature and progress of their work. I always make sure that there are working agreements in place about whether it is acceptable to look at each other’s boards and I’d never go as far as to mandate personal Kanban. Also, I always make sure that my own board is visible! Overall, I have found Kanbanfor1 has supported the adoption of Agile at an organisational level through better coaching opportunities, increased visibility and shared understanding and through making it possible for people within an organisation to collaborate around individual tasks and to help each other if someone has too much or too little work to do. 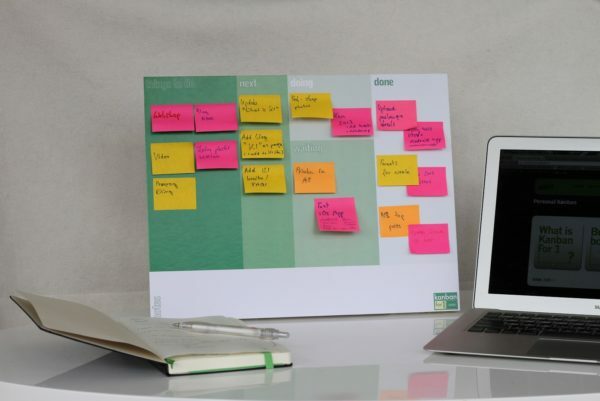 If you’d like to have your very own and beautifully designed Kanbanfor1 board grab one from our shop. Tags: improvement, Kanban, Kanban boards, Kanbanfor1, Lean, multi-tasking, Organisational change, Organisations, Personal Kanban, Productivity. Just Another F&#k!ng Agile Conference - We did it!